This article originally appeared on Dante Lauretta's blog and is reposted here with permission. The Lunar and Planetary Science Conference (LPSC) brings together scientists from across the world to present their latest results in planetary science. LPSC began in 1970, right after the first Apollo Moon landings, and has been the premier venue for planetary science research ever since. In February, 2012 the Observatorio Astronómico de La Sagra, Granada in Spain discovered 2012 DA14, a small asteroid on a trajectory that would bring it back to the Earth one year later. It was quickly determined that this small near-Earth asteroid would pass very close to Earth, so close that it would pass inside the ring of geosynchronous weather and communications satellites. NASA’s Near-Earth Object Program Office accurately predicted the path of this asteroid and indicated that there was no chance that it was on a collision course with Earth. 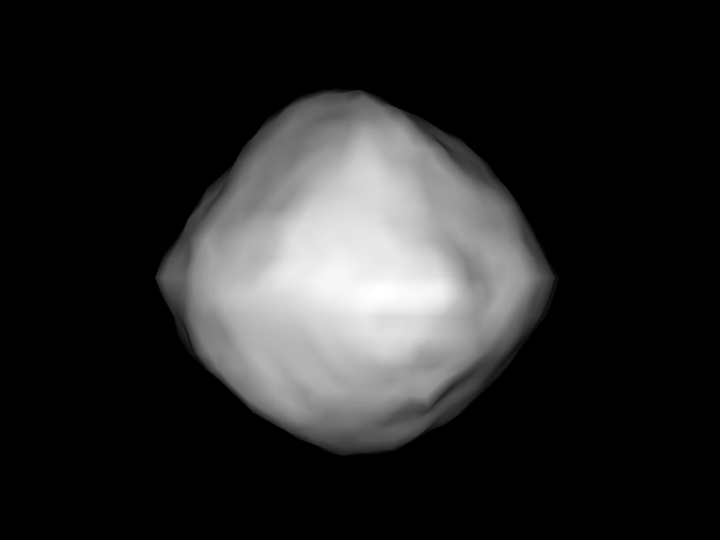 The flyby provided a unique opportunity for researchers to study a near-Earth object up close. In March, 2012, NASA decided to take advantage of this opportunity to promote the OSIRIS-REx mission and the broader agency activities in asteroid science. A major media event was scheduled for February 15, 2013, featuring myself, Goddard Space Flight Center chief scientist Jim Garvin, and Jim Green, the Director of NASA’s Planetary Science Division. At 9:20:20 a.m. local time (3:20:20 UTC) a different asteroid entered Earth’s atmosphere over the city of Chelyabinsk, Russia. The impactor’s trajectory approached Earth along a direction that remained within 15 degrees of the direction of the sun. Asteroid detection telescopes cannot scan regions of the sky this close to the sun. 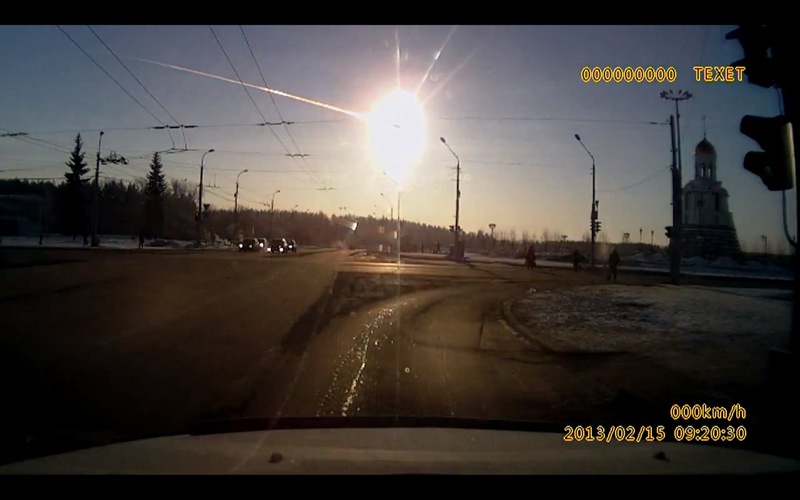 Thirteen seconds after atmospheric entry, at 9:20:33 a.m. local time (03:20:33 UTC), the fireball, traveling at a velocity of 11.6 miles per second (18.6 kilometers per second), achieved its maximum brightness just south of Chelyabinsk, at an altitude of 14.5 miles (23.3 kilometers). The 18-meter asteroid had a mass of about 11,000 tons and exploded in the atmosphere with the energy equivalent t0 440 kilotons of TNT. Across the Chelyabinsk region, windows were shattered, buildings collapsed, and hundreds of people were injured. What started out as an upbeat story on a interesting astronomical event quickly turned into Asteroid Friday – the largest meteorite strike on Earth in over a century! A dashboard camera captured this stunning image of a small asteroid entering the Earth’s atmosphere on Asteroid Friday – February 15, 2013 – the same day that a much larger asteroid passed within 34,050 km (21,160 mi) of the Earth. Meanwhile, on the other side of the globe the Secretary of the Canadian Treasury Board gave the final approval for the Canadian Space Agency to develop the OSIRIS-REx Laser Altimeter scientific instrument. This important approval milestone allowed the OLA team to give their full attention to the mission. OLA is an advanced lidar (Light Detection and Ranging) system that is a hybrid of the lidar on the Phoenix Mars Lander’s Canadian weather station and an instrument flown on the 2005 US Air Force eXperimental Satellite System-11 (XSS-11). OLA will scan the entire surface of the asteroid to create a highly accurate, 3D model of Bennu, which will provide the team with fundamental and unprecedented information on the asteroid’s shape, topography, surface processes and evolution. OLA uses a receiver and two complementary lasers to provide the information about the asteroid surface. OLA’s high-energy laser transmitter will be used for scanning from further distances (from 1 to 7.5 km from the surface of Bennu). The low-energy laser will be used for rapid imaging at shorter distances (500 m to 1 km) to contribute to a global topographic map of the asteroid, as well as local maps to assist the team in selecting the best site for sample collection. MacDonald, Dettwiler and Associates (MDA) is designing, building and testing the instrument for the CSA. 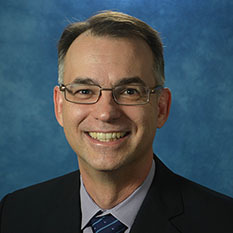 The Principal Investigator for the Canadian science team is led by Alan Hildebrand of the University of Calgary. Michael Daly from York University is the OLA instrument scientist. The team also includes researchers from University of Winnipeg, University of Toronto and the University of British Columbia. In early March OSIRIS-REx passed its Mission and Flight System PDR and was deemed ready to proceed to Phase C by the Standing Review Board. It was a demanding and exciting week and the review board did a great job digging in to understand the details of our mission design. At the end of the day they gave us a green rating with no liens on the review – an outstanding grade. Specific areas of strength that were highlighted include the elegant TAGSAM head design, the strong involvement of the Science Team in key areas of mission design, good heritage, an excellent team with good working relationship, the power of the Design Reference Mission and Design Reference Asteroid as tools for focusing the design effort, and the fact that our contamination control is well conceived. I am extremely grateful for the tireless efforts and inspiring dedication of everyone on the OSIRIS-REx team. I am proud of the excellence that we demonstrated that week. On March 6, 2013 I was invited to submit a letter for the record at the Threats From Space hearing of the US House Committee on Science, Space, and Technology in response to request from Representative David Schweikert (AZ-06). On March 25th, I had the honor to give two briefings on the OSIRIS-REx Asteroid Sample Return Mission to policy makers in Washington DC. My first stop of the day was at the White House Office of Science and Technology Policy (OSTP), where I gave a Brown Bag lunchtime seminar on OSIRIS-REx. The meeting started out on a high note since I was able to pass around several fragments of the Chelyabinsk chondritic meteorite, which had exploded over Russia just one month prior to this presentation. Later that afternoon, I traveled to Capitol Hill to provide a similar briefing for staff members of the House Science, Space, and Technology Committee. The conversation was dynamic and covered a wide range of topics from Solar System formation to asteroid impact hazards, and resources of near-Earth space. 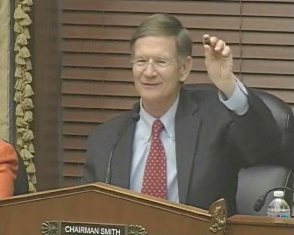 I also left behind a sample of Chelyabinsk to pass on to Committee Chairman Lamar Smith. The Chairman used the asteroid fragment to highlight the Chelyabinsk airburst event and kick-off the Full Committee Hearing – Threats from Space: A Review of Private Sector Efforts to Track and Mitigate Asteroids and Meteors, Part II. Chairman Smith gives props to the University of Arizona for providing a sample of the Chelyabinsk meteorite for the Threats from Space hearing. Our Name that Asteroid! came to a successful conclusion when the panel of judges picked Bennu as the winning entry. 1999 RQ36 is now Bennu! As May 1, 2013 it became official, our asteroid is named Bennu, thanks to the winner of our “Name that Asteroid” contest, 9-year-old Mike Puzio. I was able to tag up with Mike and his father during the Planetary-Society-sponsored Google Hangout. 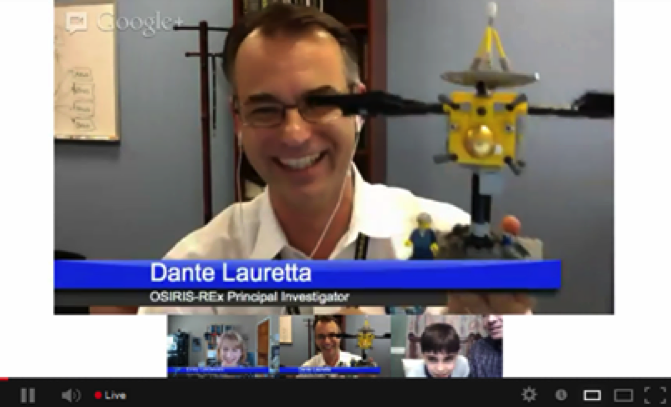 I participated in my first Google Hangout with Name that Asteroid! contest winner Mike Puzio and his father. This was a hard choice, as the judging team, composed of team members from OSIRIS-REx, the Planetary Society, and the MIT Lincoln Labs (who run the LINEAR asteroid survey that discovered Bennu) had to navigate cultural sensitivities, adhere to the naming criteria for near-Earth objects, and find something easy to spell and pronounce, to choose a name that had good metaphorical ties to our mission. I think that we were successful. 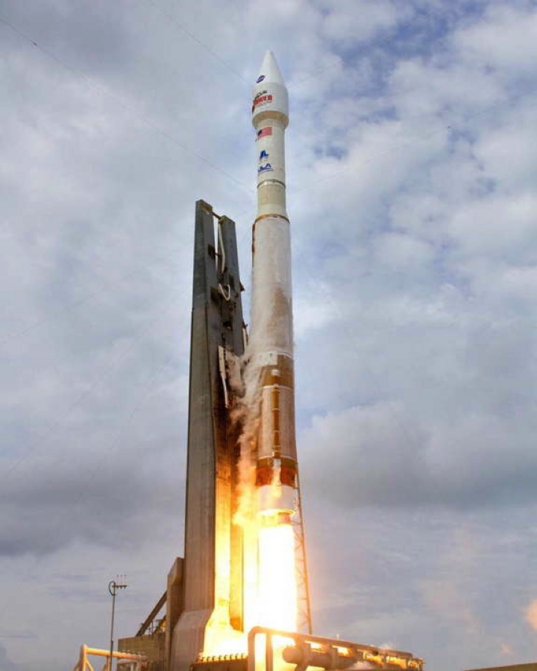 OSIRIS-REx reached a major milestone on May 16: The project passed the agency-level confirmation review called Key Decision Point-C, or KDP-C. At this review the NASA Agency Program Management Council authorized continuation of the project into the next phase of development, giving the team the authority to proceed toward launch in 2016. OSIRIS-REx is ready to proceed into the next phase of mission development. “This means we have now made the final deal with NASA in terms of the mission objective, the cost cap and the schedule all the way from development and launch through Earth return,” said Dante Lauretta, UA planetary science professor and the mission’s principal investigator. Lauretta said obtaining NASA’s final approval was a great achievement in continuing the vision and legacy of Michael Drake, former director of the UA’s Lunar and Planetary Lab who died in September 2011. We followed up this successful milestone with Celebration of Confirmation at the University of Arizona. In addition to bringing the team together, we said farewell to retiring team members Joe Vellinga and Peter Smith. We also unveiled the portrait of Mike Drake that hangs in the lobby of our operations center in Tucson, which bears his name. 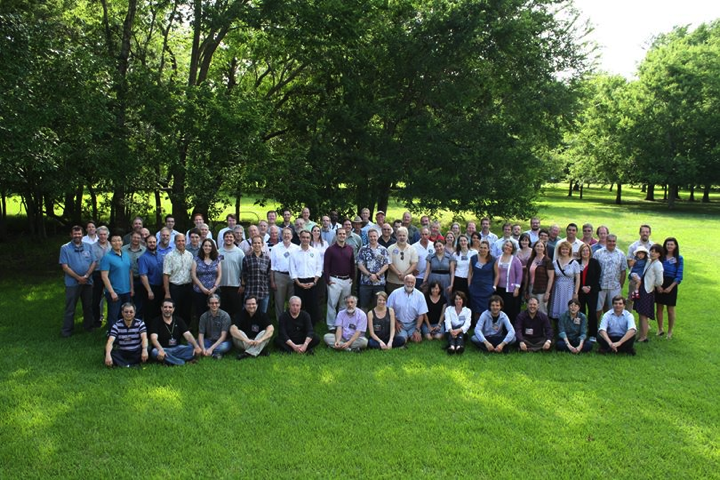 The OSIRIS-REx team held their fourth science team meeting in Houston last June, hosted by Science Team member Lindsay Keller of the NASA Johnson Space Center. The meeting started out with a full-scale rehearsal of opening the Sample Return Capsule and disassembling a loaded sample collector head. This review was a great success and many important lessons were learned about how to handle the precious extraterrestrial cargo once it is back on Earth. This rehearsal is just the first of many to come over the next decade as we prepare for the sample of Bennu in 2023. The main theme of this meeting was preparing for Phase C/D. In this phase, the Science Team is busy writing software and developing test data for the entire Sample-site Selection process. STM04 provided a nice venue to review the development plans and get everybody on the same page. In addition, this meeting featured the first of our splinter session formats. Different subsets of the project team broke into groups to review our latest progress in Bennu geophysics, contamination control and knowledge, asteroid geology, and spectroscopy. We also reviewed the latest TAGSAM (our sampling mechanism) design and discussed the latest research on modeling the spacecraft interaction with the asteroid surface. In June of this year, two important papers were published in the prestigious scientific journal Icarus, describing key aspects of our astronomical study of Bennu. The paper by Mike Nolan et al., entitled Shape Model and Surface Properties of the OSIRIS-REx Target Asteroid (101955) Bennu from Radar and Lightcurve observations, provided a detailed description of our study of Bennu using the Arecibo and Goldstone radio telescopes. Hergenrother et al. wrote the other paper in this journal, Lightcurve, Color and Phase Function Photometry of the OSIRIS-REx Target Asteroid (101955) Bennu. This paper described our telescopic study of Bennu to determine its color, rotation state, and overall nature of the interaction with light. These papers followed on from the pioneering work of Walsh et al., Introducing the Eulalia and new Polana asteroid families: Re-assessing primitive asteroid families in the inner Main Belt. Here we describe our dynamical study of carbonaceous asteroids in the main-asteroid belt, with important clues as to the origin of Bennu. This research showcases the powerful science that is being performed by the OSIRIS-REx team, even as we work tirelessly on our hardware and ground system designs. 2014 promises a continuation of our research to unlock Bennu’s secrets and help us prepare for the encounter in 2018. In June, the White House Office of Science and Technology Policy recognized OSIRIS-REx team member Dolores Hill as a Champion of Change for her work as co-lead of Target Asteroids! Target Asteroids! builds on the tremendous foundations of amateur astronomy – throughout history, amateur and professional astronomers have made exciting discoveries, collaborated to learn more about the cosmos, and teamed up to provide details about the Solar System. This project puts citizen scientists front and center in the efforts to learn more about asteroids and protect our planet. Citizen scientists provide valuable data to help planetary scientists characterize near-Earth asteroids and understand the process by which Main Belt asteroids may become near-Earth asteroids; essential steps to ascertaining the risk of impact with Earth that may affect the world’s inhabitants. OSIRIS-REx team member Dolores Hill was honored by the White House for her work on our Target Asteroids! program. In August, NASA selected United Launch Services LLC of Englewood, Colo. to launch the OSIRIS-REx spacecraft. The OSIRIS-REx mission is now scheduled to launch in September 2016 aboard an Atlas V rocket from Space Launch Complex 41 at Cape Canaveral Air Force Station, Fla. This launch service contract is valued at $183.5 million. This price includes payload processing, integrated services, telemetry and other launch support requirements. On September 11, 2013 OSIRIS-REx team members Ed Beshore, Jonathan Gal-Edd, Mike Moreau, Allan Cheuvront, and Ken Williams traveled to Darmstadt, Germany to the European Space Operations Center (ESOC) to visit with the ESA Rosetta Mission ground operations lead and members of the flight dynamics team. Rosetta is a mission to a comet. A lander will be placed on the surface to observe the activation of the comet as it nears the Sun. An orbiter will take observations at the same time and collect and forward transmissions from the lander. The Rosetta probe wakes up in January, and the mission is well under way by the end of summer, 2014. The overall challenge of the Rosetta Mission is similar to that of the OSIRIS-REx mission. Overall, we have done very similar planning, share many of the same issues, and replicated many of the same decision trees as Rosetta. Many ideas were exchanged and, at the end of the trip, both the Rosetta and OSIRIS-REx teams felt the conversation was extremely valuable. We look forward to continued collaboration with our European colleagues. The retirement of Peter Smith left some big shoes to fill. 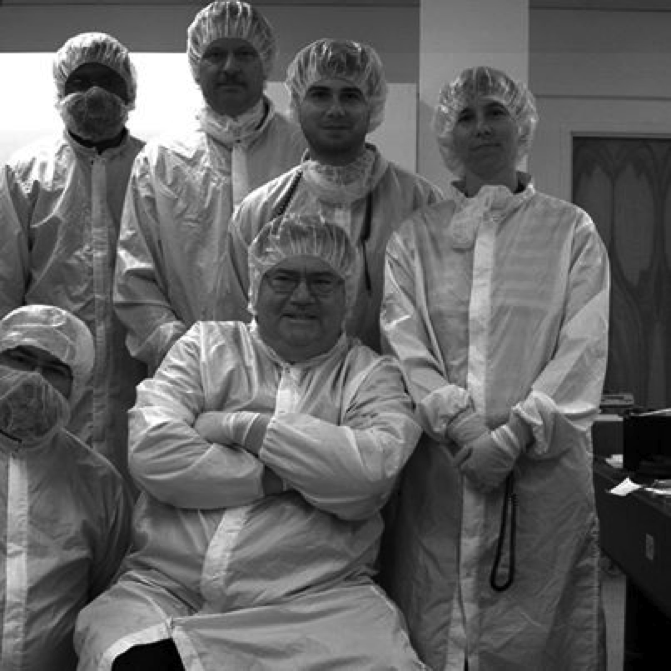 Peter served as both the OCAMS Instrument Scientist and the Image Processing Science Lead for OSIRIS-REx. In order to handle both of these tasks, I requested permission to add two new Co-Investigators to the OSIRIS-REx science team. In September, I received a letter from NASA Associate Administrator John Grunsfeld indicating that my request was approved. 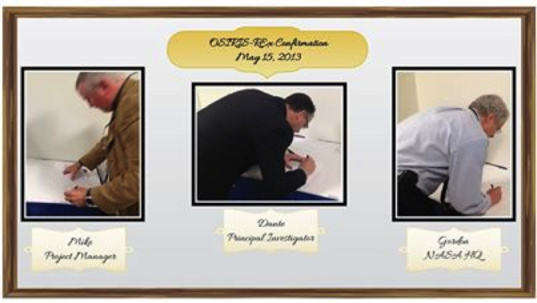 I was pleased to announce to the team that Ellyne Kinney-Spano and Christian d’Aubigny have been approved as Co-Investigators on the OSIRIS-REx mission, with all attendant privileges and responsibilities. Ellyne is serving as the Image Processing Lead Scientist and Christian is the Deputy Instrument Scientist for OCAMS. Bashar Rizk, Peter’s former deputy, was promoted to the Lead OCAMS Instrument Scientist role soon after Peter’s retirement. 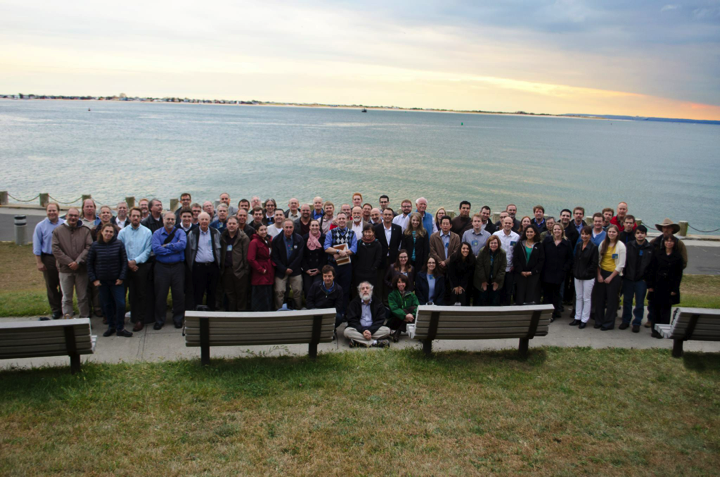 Our fifth Science Team Meeting took place at Kingsborough Community College in Brooklyn, New York, hosted by Mission Sample Scientist Harold Connolly. A Data Visualization Workshop preceded the meeting. Here we had a chance to take a look at our new software package – J-Asteroid – in development at Arizona State University. At this meeting we heard status updates from each of the instrument teams. We continued our splinter-session format, focusing on sample-site selection and characterization, the impact of wobble in Bennu’s rotation pole, data products and processing, and more asteroid geology. The meeting ended with the whole team participating in a discussion of asteroid astronomy, including some exciting new analyses of our observations of Bennu using the Spitzer Space Telescope. Stay tuned in 2014 for publication of these results! In October, the OCAMS and SPOC Teams accomplished a significant milestone for the OSIRIS-REx Mission. An end-to-end data test was successfully completed, which started with capturing an image using the OCAMS engineering model of SamCam and a prototype Camera Control Module, transferring that image through a test-like-you-fly ground data system, and ending with that data displayed on both the OCAMS and SPOC Ground systems. The SamCam, one of the three OCAMS cameras, will meet all of its imaging requirements using a flight like CCD from Teledyne/DALSA. On the SPOC side, the data was processed using the archetype of the pipeline processing software being developed for flight. Credit for this work goes to the entire OCAMS team including the Detector Assembly group at Space Dynamics Lab and the SPOC Team. Special credit on the SPOC effort goes to the small group working the OCAMS portion of the pipeline to the finest detail pushing the ground system to a demonstration level at this early juncture. It is great to see the hardware being built and operating according to plan. The OCAMS team assembled their first engineering model camera and captured this image. A United Launch Alliance Atlas V lifted off from Space Launch Complex 41 at Cape Canaveral Air Force Station in Florida to send the Mars Atmosphere and Volatile Evolution, or MAVEN, spacecraft on its way to study the Red Planet’s upper atmosphere. The OSIRIS-REx Project Manager, Deputy PM, Project Scientist, Spacecraft Manager, and Chief Safety Officer sat on console during the launch to gain valuable experience getting ready for the OSIRIS-REx launch in 2016. I was able to watch MAVEN lift off from the Saturn V Building at Kennedy Space Center – it was a flawless launch and inspired me for our upcoming journey into space. We took advantage of the time in Florida to hold a face-to-face meeting with the OSIRIS-REx team members at Kennedy Space Center and the United Launch Alliance. We discussed the current plans for our launch preparations and the interface between the spacecraft and rocket. In addition, we held a Contamination Peer Review where we looked at the entire mission timeline from now until End of Mission in 2025 and reviewed our plans for keeping the sample in a pristine state for scientific analysis. 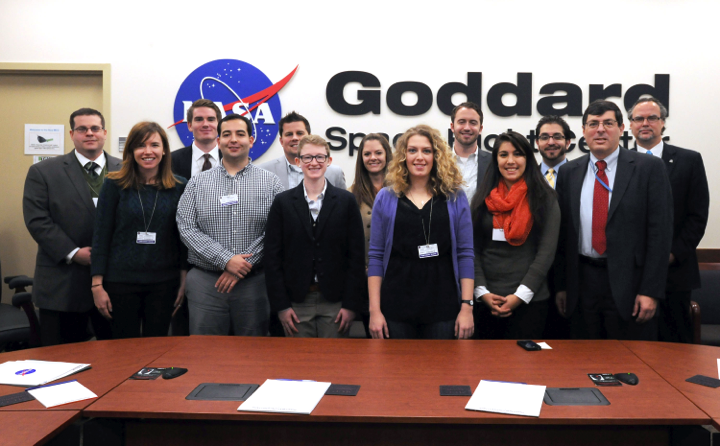 We had 10 of the 11 Arizona congressional offices participate in a visit to the NASA Goddard Spaceflight Center. Center Director Chris Scolese welcomed and met with the delegation for 45 minutes and emphasized the strength of NASA Goddard’s relationship with Arizona, and specifically the University of Arizona. The Arizona congressional delegation visited Goddard Space Flight Center to learn about the many partnerships important to our state. The staff members then received a detailed brief on OSIRIS REx from Deputy Project Manager John Loiacono and on the James Webb Space Telescope from Amber Straughn. They viewed elements of the JWST in the Spacecraft Integration and Test Complex and were given the “Science on a Sphere” briefing – which made a big impression on the congressional staff. They also received two smaller briefs (MMS and DSCOVR), where they saw spacecraft in full-scale assembly. I want to express my thanks to everyone involved in coordinating this important trip. Special thanks go out to Shay Stautz, our Federal Relations officer at UA, for organizing the entire visit. Hardware development continued at a furious pace in the latter half of 2013. OLA achieved an important milestone, demonstrating their first laser raster scan in early December. The Canadian team has made great strides in gaining back their lost schedule since receiving Treasury Board authorization in February. 2014 will be the year of our Critical Design Reviews, the next major milestones in completing the design of our flight and ground system. The OSIRIS-REx Thermal Emission Spectrometer always leads the pack, and was the first team to go through this important step. OTES successfully completed their Critical Design Review in early December. Congratulations to Phil Christensen, Greg Mehall, Vicky Hamilton, their Moog Broad Reach partners and the entire OTES team on an exceptional job. The Review Team was very complimentary to OTES, stating that the OTES Team is very well versed in all areas of instrument development, test, and operations, and that communication between team members is outstanding, resulting in an integrated team that can deliver a quality instrument! On December 9, 2013 the OSIRIS-REx mission reached a symbolic milestone. At 5:43 pm MST/7:43 pm EST our countdown to launch began – marking 999 days to the opening of our launch window. Starting the countdown clock carries a lot of symbolism for us. After December 9, we will have a constant reminder of the time remaining to send OSIRIS-REx on his quest to return a sample from asteroid Bennu. There are many ways to become part of this mission. Join us on this amazing journey into the Asteroid Frontier!